This combination adds 80 damage to Raichu GX's attacks. 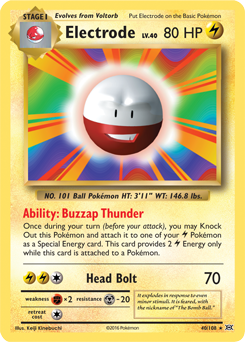 From Evolutions, this Electrode allows you to KO itself to provide an additional two energy. Giving your opponent a prize is a heavy downside, though, especially if you have Enhanced Hammer running around. Also released in Shining Legends, this Raikou has the same ability as baby Yveltal, attaching an energy from the graveyard to a benched Pokémon. Additionally, you have Max Elixir to grab additional energy from the deck. If running Magnezone, in addition to Clemont, one could consider Fisherman to add energy that gets discarded by Sycamore/Ultra Ball (run four of each) or from your KO'd Pokémon. The deck is unlikely to make a big splash in the meta. Darkrai and Gardevoir are both decks that already excel at energy acceleration, and the case is easy to make that it does it better than Magnezone. So, how would you build this deck? Are there Electric support cards I've looked over that work well with this deck? 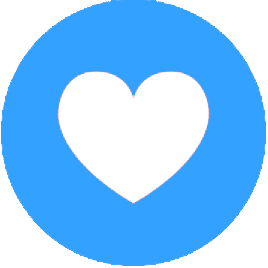 Would you consider adding Vikavolt for additional acceleration? How many rare candies and evosoda would you include? Is Aether Paradise Conservation Area worth including to help prevent snipes on your unevolved Pokémon and get rid of Po Town? Prof's Letter is probably better than Clemont because you can play a supporter alongside it and play multiples in a turn. The deck is unfortunately outclassed by Turbo Dark in Expanded because of Dark Patch, Hoopa, Darkrais/Ytal being basic and thus both easier to get into play AND easy to support w/ Elixir, and generally being less clunky (all of the support you mentioned is stage 1/2). It might be worth looking at in Standard but obviously not as a meta contender. Baby Ray might be better than Raikou, haven't really thought about it. If you chose 4x Sycamore, would that make you more likely to include Fisherman/a higher energy count? You listed 3-2-3 Magnezone, but didn't include Rare Candy. I think I'm used to seeing like 3-1-3 with 2 candies, so I'd be interested in how you came to that line. In terms of Pikachu, the only one with 70HP (relevant for Shuriken snipes) is SM Promo 4, which was given out at Target on the release of Sun & Moon. It is only a few dollars, but probably an unexpected cost to building the deck. Brigette lets you accelerate your set up, grabbing every Basic piece you need (Pikachu, Magnemite, Raikou). Raichu GX sits at 210HP, which means it can (sometimes) (usually) survive an attack before going down. If a Raichu GX dies with a bunch of energy attached to it, that weakens your position considerably, making your next Raichu much weaker. 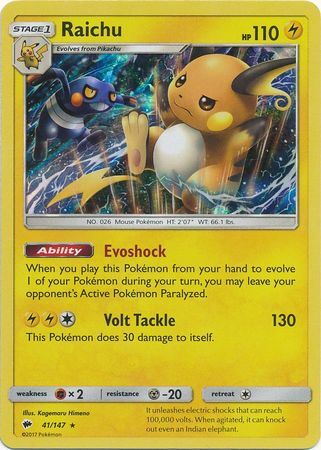 Tapu Koko GX offers an alternative that allows you to retreat a damaged Raichu and grab the energy attached to it. In terms of saving energy, these two Tools also allow it. 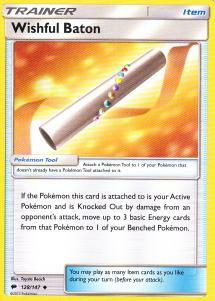 Wishful Baton allows you to transfer 3 energy, which is conveniently the number needed for Raichu GX's other attacks, Raikou's secondary attack, Tapu Koko GX's attacks, and even Magnezone's attack in a pinch. The downside to Wishful Baton is that your attacker doesn't have a Choice Band attached to it, which could make Raichu miss some KOs. An alternative to Wishful Baton would be to attach EXP Share to your non-attacking Pokémon instead. This offers less total energy retrieval but means your attackers can still hit for full power. EXP Share can combine with Tapu Koko GX to make the downside of attaching to a Voltorb or Magnemite go away. The other downside to EXP Share is the counterpart to not attaching Choice Band: not attaching Float Stone. While it doesn't work very well with Raikou (Shining Legends), cards like Super Rod or Brock's Grit are other options for recycling energy. 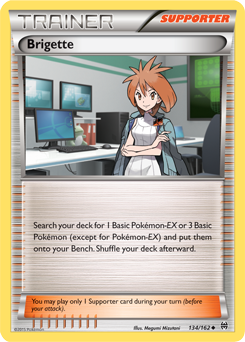 Raichu GX is clearly the better attacker, but would a 3-1 Raichu GX/Raichu (BUS) line be viable? The paralysis from Evoshock could give you another turn to set up. 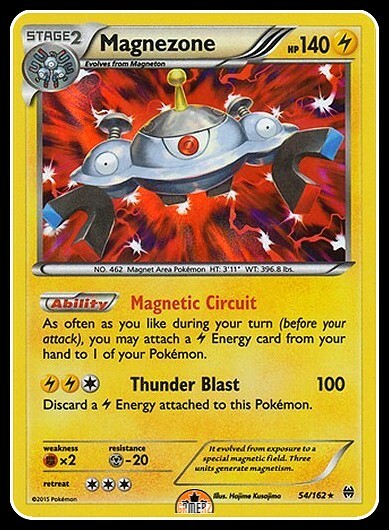 The more I think about it the less I like Magnezone as a card. No need to run stage 2s when you can run a stage 1 instead.